This article first appeared in the Rushville Republican on November 22, 2016. We are a fortunate community in the fact that our young people are so actively involved in volunteering and philanthropic activities. 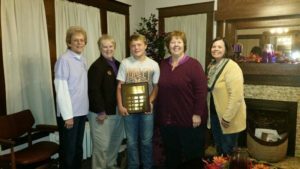 For the 4th year, the Rush Memorial Hospital Foundation has awarded the Rush County Youth Volunteer of the Year Award. The 2016 recipient is Aaron Duncan. Aaron is the son of Mary and Craig Duncan of Milroy. Aaron is a sophomore at RCHS and has an extensive resume of volunteer and philanthropic experiences. He bakes cookies for shut-ins, assists with his church’s VBS, runs a recycling business with his brother, has collected items for the animal shelter, donated clothing, visits the elderly, volunteers at various fundraisers, assists neighbors with yard and housework, and has helped the RCHS track team in a voluntary capacity. Aaron was presented a plaque with his name engraved at the annual RMHF Seed Circle Anniversary Celebration. According to Debbie Meek, RMHF Seed Circle member, “We have great kids in our community. They are so involved in many projects and help so many people, churches, and organizations. It is wonderful to recognize their efforts.” The plaque is permanently located outside the RMH Radiology Department. Aaron will also receive $300 from Rush Memorial Hospital at their employee Christmas party. It is a pleasure for the Rush Memorial Hospital Foundation Board to recognize our local outstanding youth. Congratulations Aaron and all of our philanthropic young people in Rush County. Keep up the great work.